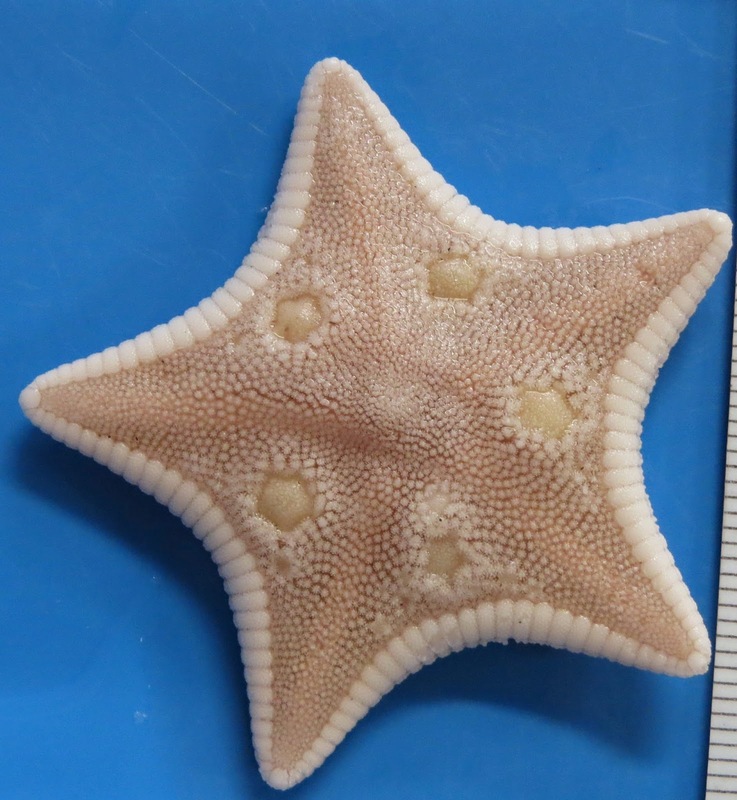 Some Excellent Japanese Echinoderms! Textures and Closeups! I've been in Japan for the last 6 weeks studying Japanese sea stars at the National Museum of Nature and Science in Tsukuba, Japan! Trophodiscus almus. 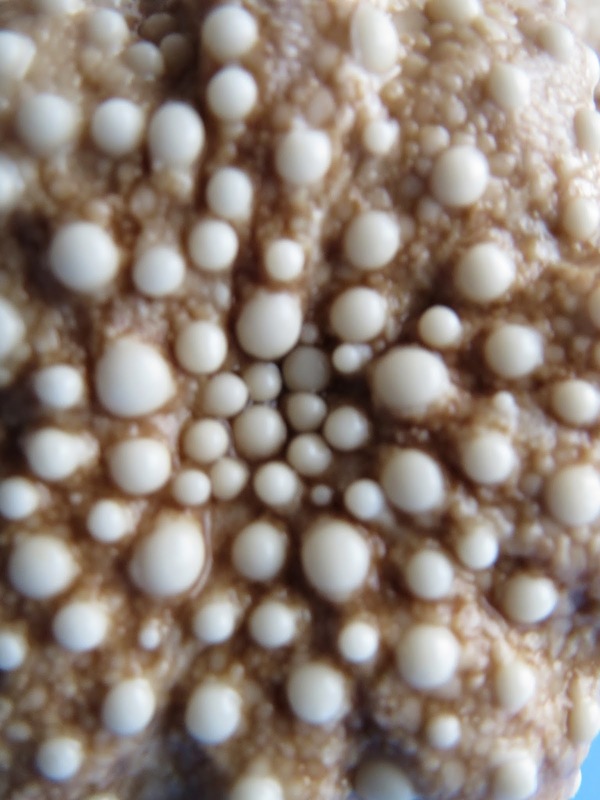 This is an unusual species, which brood baby sea stars on its top surface! You see those weird round to star shaped white spots on the surface? 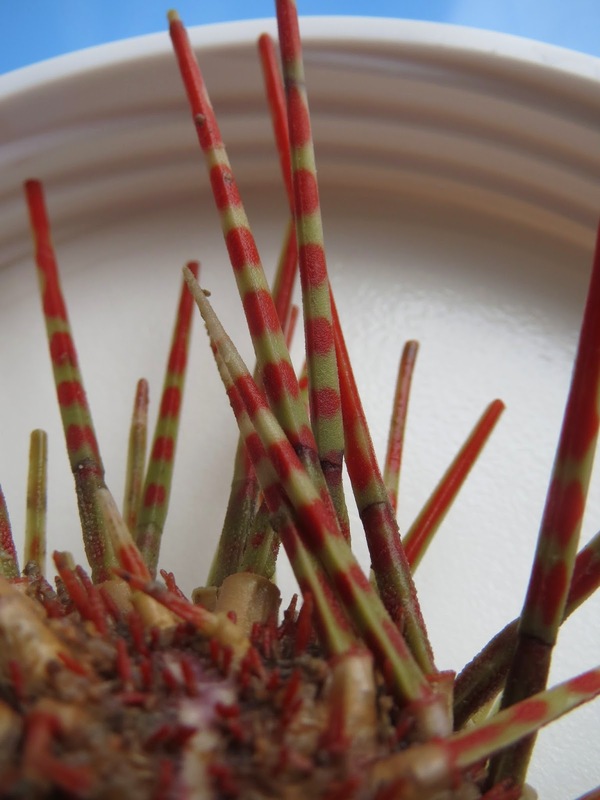 Those are the juveniles which live on the surface among the "forest" of spines present..
A close up.... 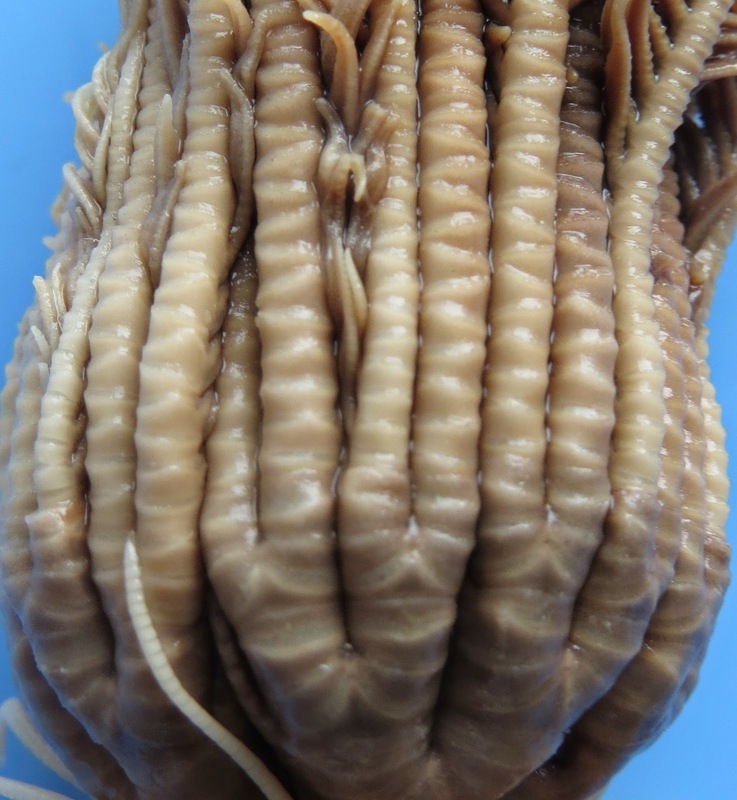 I've featured this species before as seen in Japan, courtesy of my colleague Yoichi Kogure!! 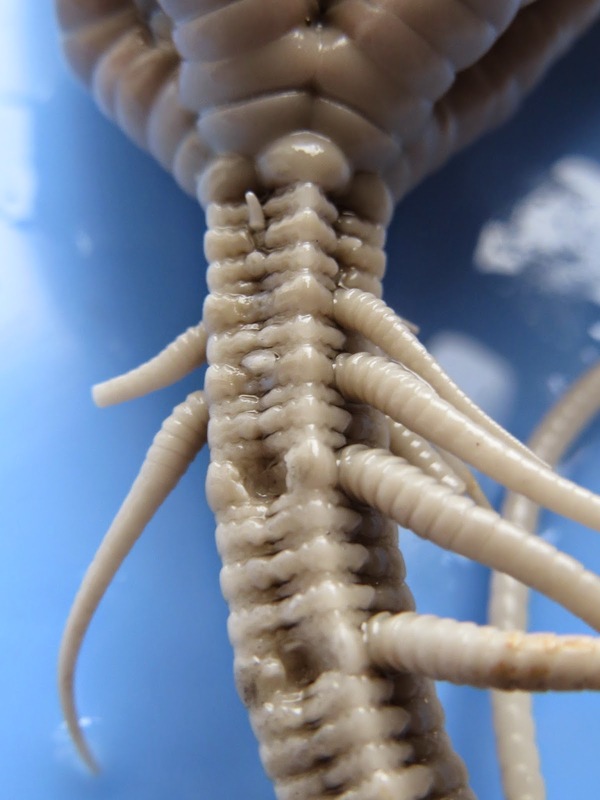 The Japanese name for this species is komochi-momiji, aka the "starfish with babies"
Close up of the stalked crinoid Saracrinus nobilis! This closeup shows us the arrangement of plates on the various arms and how they fuse together to form the various skeletal architecture used to identify them and to compose the arm structure..
A picture of the stalk.. note the angles!! Cool! 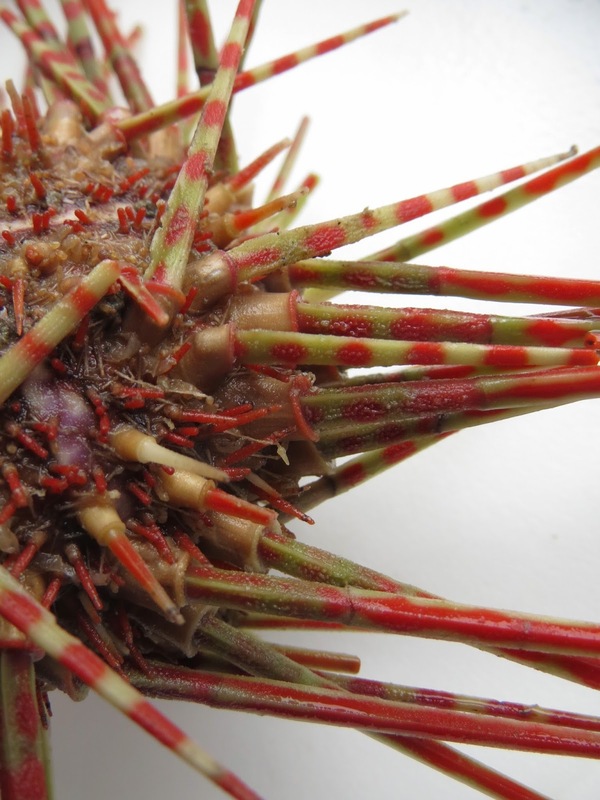 Here's the spines of a beautiful species, Coelopleurus maculata! I've covered Coelopleurus briefly before. Their tests are naturally rich and colorful!! Again, to emphasize: The spine colors are NATURAL. nothing added!! 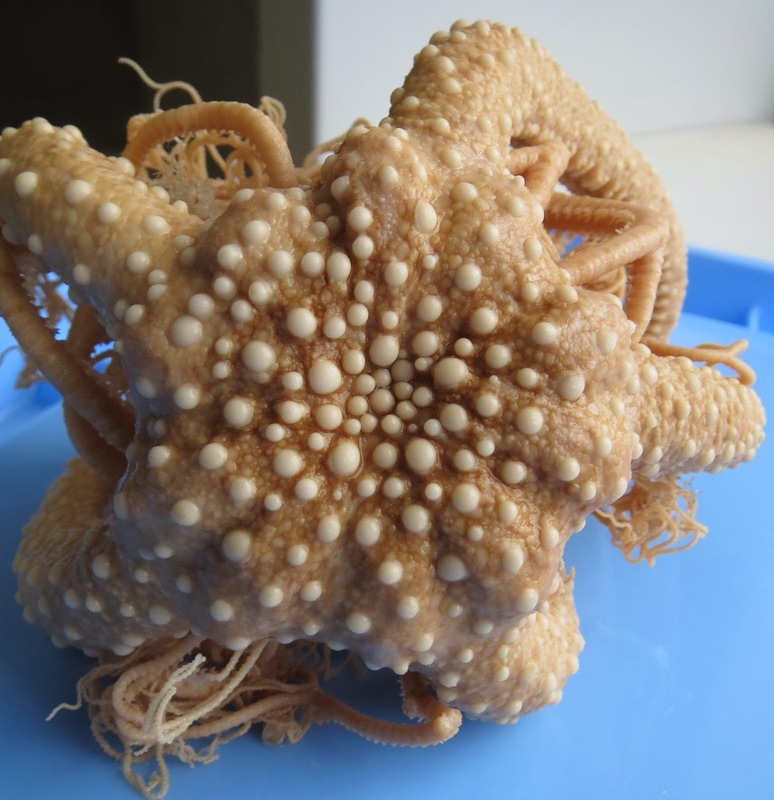 an interesting tropical basket star! 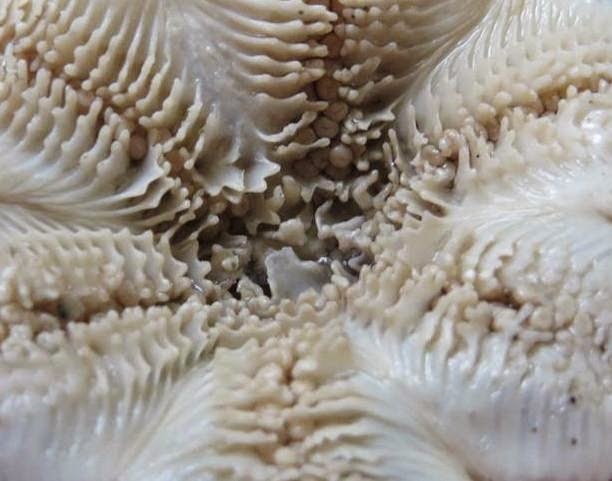 Deep-Sea Starfish Mouths: What do YOU see? So, the other day I showed some of my friends one of these close up shots and the reaction was varied. I said "BLEARGH" for one, some agreed. Some disagreed. Some were offended!! Are these close up of the mouths of Japanese deep-sea sea stars some kind of undiscovered rorchach blot? A window into the soul?? Thanks again to the National Museum of Nature and Science for their support of my visit! 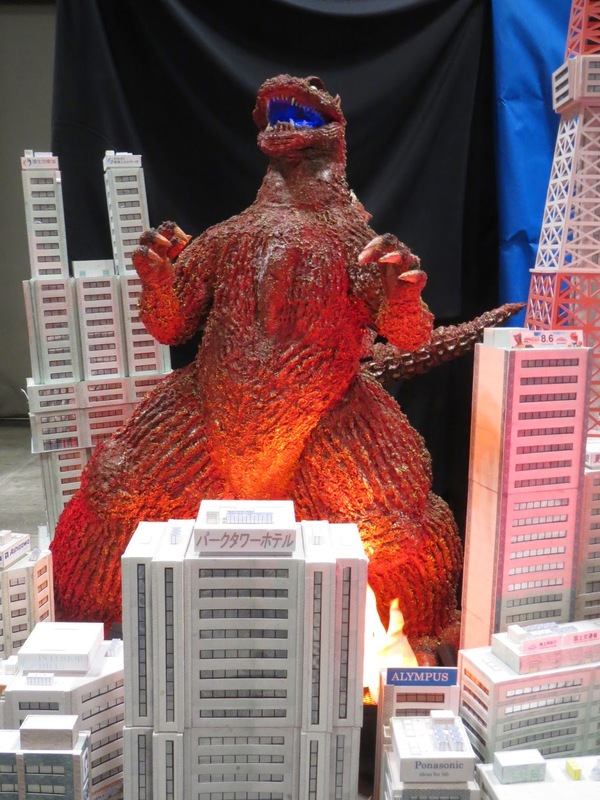 Natural History in Unexpected Places: WONDERFEST-Japanese Science Fiction Toy Show! JAPAN! So many amazing things! Sometimes in unexpected places!! Today, an unusual post. As many of you know I'm currently visiting Japan to study the Sea Stars of Japan at the National Museum of Nature and Science. In a happy coincidence with this year's visit, my trip took place at the same time as the massive Japanese science fiction/toy and model-kit show called Wonder Festival. I have a uh... passing interest in Japanese pop culture.. Godzilla, Ultraman, so forth...and so, why not? I've never been to one.. I wonder what its like?? HUGE. A massive space with a massive crowd! But one of the things I had NOT expected was to see how this incredible pool of artists, craftsmakers, modellers, and even retailers were heavily influenced by Natural History! In other words: BIOLOGY. ZOOLOGY. FISH! INVERTEBRATES! Even ROCKS!! Here in this enclave of fantasy were an innumerable number of items which were inspired by the natural world!! I saw everything from actual animal skulls for sale to various figure kits and monsters inspired by insects, sea stars and more! I don't know if I should have been surprised but I was VERY impressed by how creative and frankly, f*cking STUNNING some of the art and displays were... and yes much of it for sale. 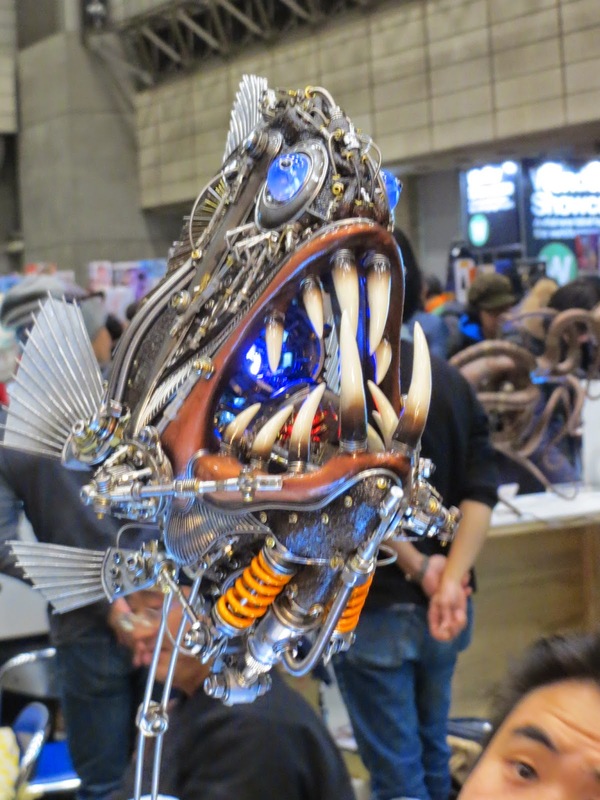 I've mentioned in other posts, how the Japanese apparently have a pretty huge appreciation for natural history and an inordinate fondness, if not outright obsession with various marine invertebrates..
and this one was all about the Giant Isopod stuff seen from Japanese social media..
A steampunk Fangtooth Fish! My pictures don't do it justice.. But steampunk fish were not the only fish in attendance. Actual fish skeletons were also to be had! Here are some cool preps in tiny glass/plastic boxes!! Invertebrates were also well-represented!! Here are some resin or porcelin (not sure I remember) highly detailed STOMATOPOD figures! Each about 2 inches (6 cm) long. But MY favorite??? The paper craft model of the Cambrian predator Anomalocaris!! Some interesting snails with a skull motif!! I don't honestly remember what these figures were made of but they were visually AMAZING. Here.. some horseshoe crabs that have never looked better! And then, there was this guy, who had metal casts of various crabs in various sizes... these are parthenopids I believe (elbow crabs). and of course, you always got the classic: Paleozoic Anomalocaris and Dunkleosteus vinyl figures!